We hadn’t intended on spending three weeks here. It just happened. A short visit to a friend in Dublin became two longer sojourns, with time spent in Belfast before and Galway in between. I didn’t really know what to expect of Ireland. I am familiar with its literary heritage, as its son, Oscar Wilde, is one of my favorite writers, and its turbulent and violent history in its quest to forge an identity. 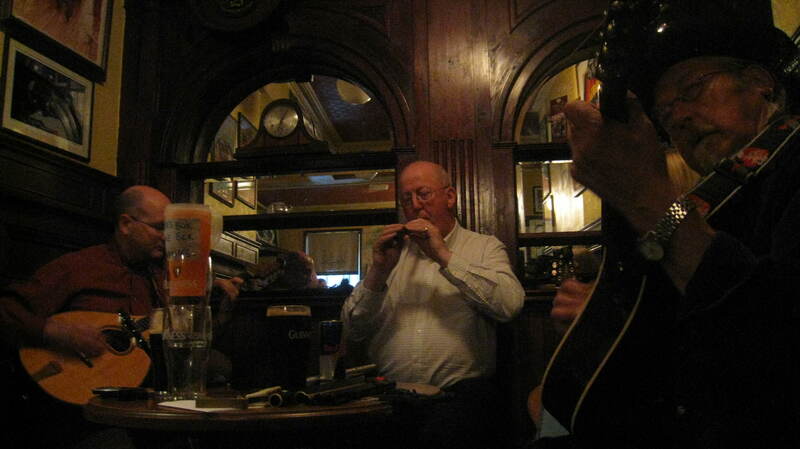 I knew it wasn’t simply pubs and Guinness, guitars, fiddles and whistles, green hills, wet weather or witty banter. Yet it is all of these things. But then again it’s not. To this day it suffers from an identity crisis of sorts. There is something rudderless about the place, as it tries to find its way again. This it to be expected, I suppose, given its wild and woolly genesis – conquering at the hands of the Vikings and the Normans, centuries of suppression by the English, squabbles leading to downright war between Catholics and Protestants, discrimination of Catholics, mass immigration of Irish to the New World, loyalty to the Crown vs. belief in the Free State, the Act of Union, the War of Independence, the Civil War, the creation of the Republic (minus six counties to the north), and admission to the European Union and the Eurozone. 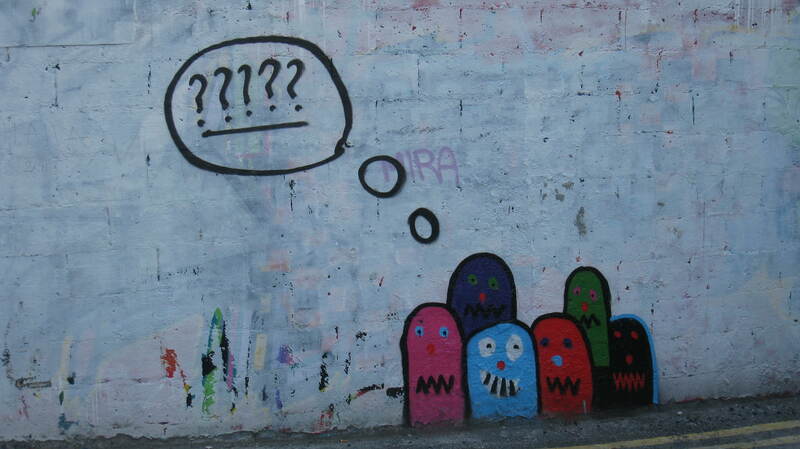 This last one is most interesting, for Ireland, after years of rebelling against Westminster, joined a community that governs not from Ireland but the Continent, and today, in the wake of the 2008 financial crisis and subsequent recession, it is beholden to the EU/IMF as it repays its debts, a result of massive borrowing. 1. Guinness Guinness everywhere. And it tastes better here. 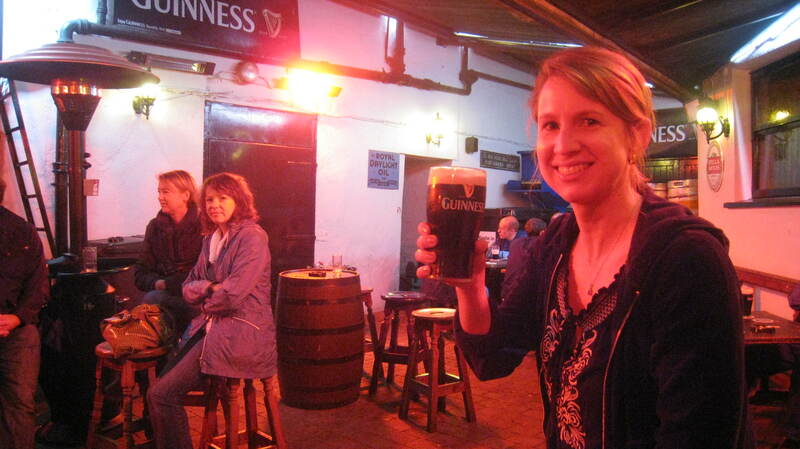 It sounds cliché, but Guinness is the drink of Ireland, and it truly tastes better here. It is rich, almost savory, with lovely layers and a creamy finish. We consumed many, many pints of it along with the locals and the tourists trying to be locals. The Guinness Brewery is right in the heart of Dublin, so it makes sense that the black stuff is at its most fresh here. However, the 15 euro price tag to tour the facility put us off, so we opted to experience it in a real setting with real people, i.e. the local pub. The Palace Bar in the Temple Bar area of the city pours the best pint, although O’Donoghue’s, O’Neill’s and The Brazen Head are not far behind. 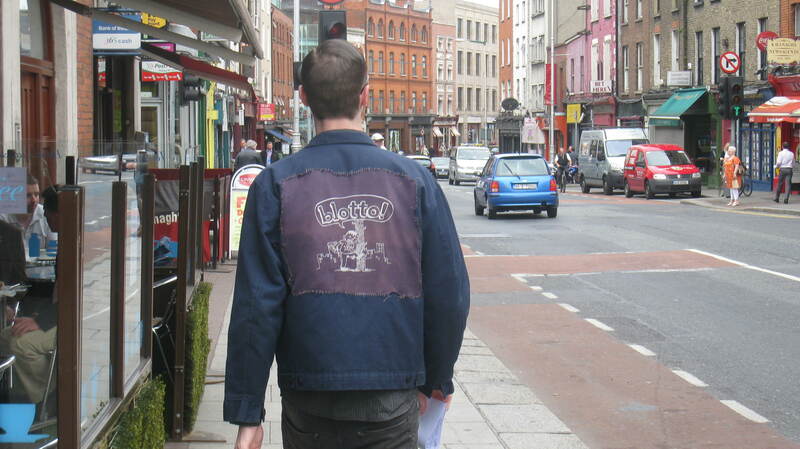 Ireland is known for its drinking culture, to the point where it is the stuff of satire and ridicule and stereotype. The Irish do drink and they drink a lot, often to excess, examples of which we saw on the streets each night (Belfast the guiltiest in this regard.) 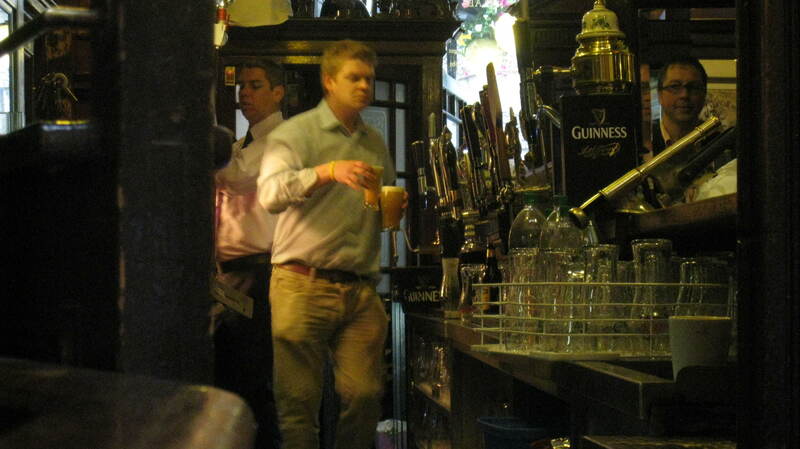 The allure of the pub is what draws many tourists to its cities and towns and it is an element of the culture that is promoted. However, there is a growing movement to adjust the tourist focus from pubs and drinking to other aspects of the country. The powers-that-be will have a tough time overhauling something that is so entrenched in the Irish psyche and practice. And quite frankly, something will truly be lost if they succeed. I shouldn’t need to elaborate and I don’t want to belabor the point. But the weather in Ireland is just…awful. For some of you the concept of overcast skies and cool temps sounds like heaven even in the summer, which leads me to conclude that you have ice in your veins and possibly scales for skin. Here the forecast is the same each day. It goes something like this: “Mostly cloudy with the possibility of some sunny patches, brief showers and gusts of wind, highs between 14C and 18C, or 12C and 20C, or let’s just say cool.” Weather prognosticators are never wrong as there is no point for precision in forecasting Mother Nature in Ireland. I once asked someone if there is ever a full day of sun in Ireland. The look I received in response was as if to ask “What, you mean it can do that?” I believe the weather is the stimulus for Irish melancholy. And quite possibly the real reason why hundreds of thousand of Irish emigrated to the US, Canada, Australia and New Zealand – not the Potato Famine, not dispossession of land, not religious discrimination. It was the weather. 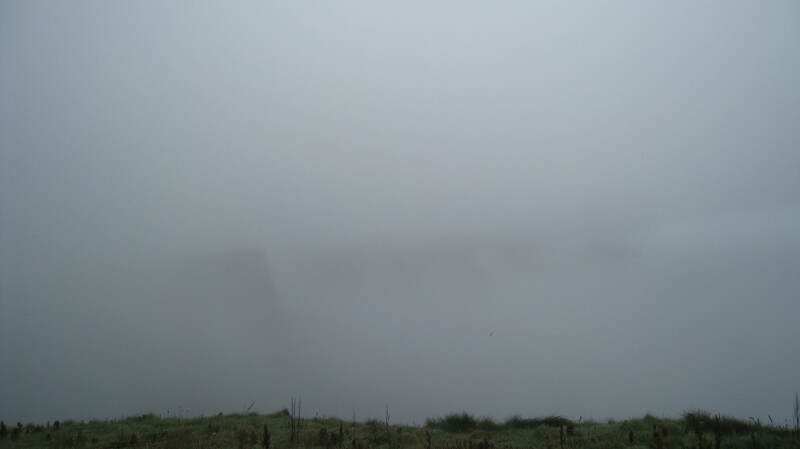 The weather was responsible for our not being able to see one of the natural wonders of Ireland: The Cliffs of Moher. 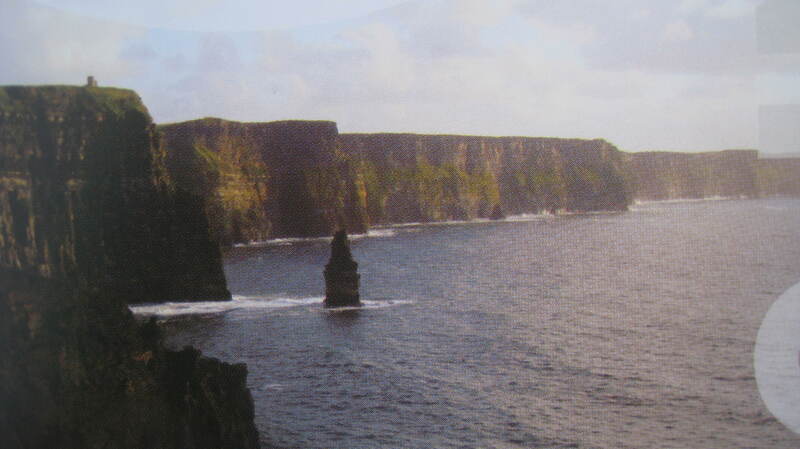 Located on the west coast just south of Galway in County Clare, the Cliffs present layers of shale and sandstone rising at high as 700 feet along the Atlantic coast with views of the Aran Islands and Galway Bay from the top. The day we decided to pay the Cliffs a visit started off promising. 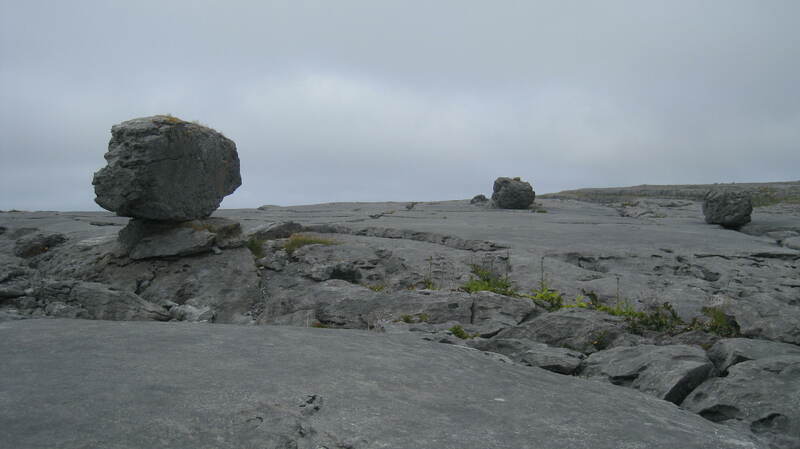 Our tour bus left Galway on time and proceeded south through the varied landscape of County Clare and The Burren, an eery but beautiful moonscape dotted with megalithic tombs and ring forts. Along the way we stopped to see weathered Celtic crosses, crumbling castles, proudly-standing portal dolmens, crumbling yet charming churches and a town devoted to matchmaking. The Matchmaker, Lisdoonvarna. 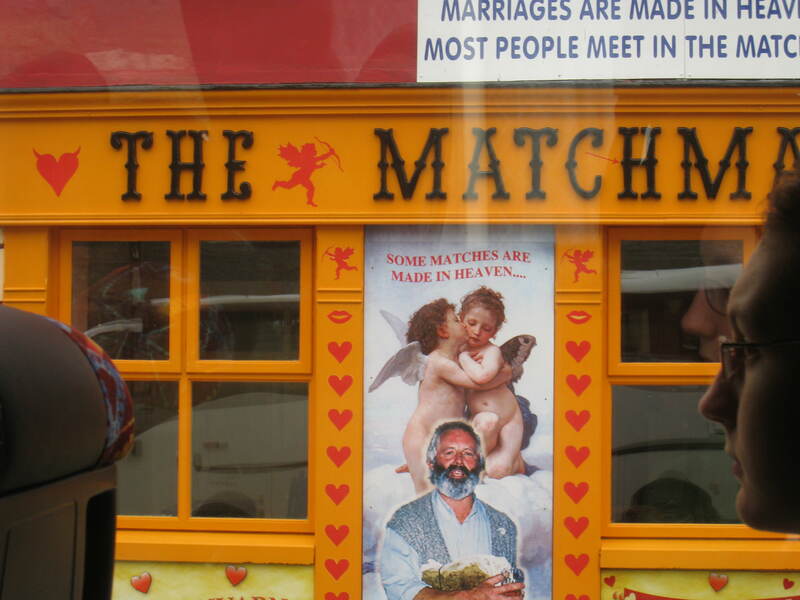 There is a matchmaking festival held here every year. Our last stop of the day was in Liscannor, home of the Cliffs. As the bus was traveling the road to the interpretive center and parking lot, we noticed a thin mist developing, which progressed into thicker fog, and then finally into a milky soup. Our affable bus driver assured us that fog rolls in all the time and usually lifts within a few hours, so there was no reason for us to worry. Really. No reason at all. Jesus, Mary and Joseph, he said. And that’s all she let us see that day. Two hours of waiting in vain for fog to lift. Or burn off. Or dissipate ever so slightly. At least we had the sweet voice of Ray to cheer us up on the way home. And a Guinness waiting for us at the pub. But it is the Irish habit of swearing that sets them apart from everyone else in the English-speaking world. The f-word is used with gay abandon, so much so that it is rendered just another word. Roddy Doyle, in his book A Star Called Henry, represents Dublin-speak so beautifully that I can hear it. Even the swear words. I have him to thank for presenting the following sentence as so, “Jaysus, yous phoquin’ eejits.” Say it out loud. Spinning a yarn is a sport, and the Irish are most expert at it. They are great storytellers, and always seem to have a witty turn of phrase when recounting a seemingly pedestrian tale. The problem is that one enters a verbal exchange expecting a conversation only to get a lecture or monologue. 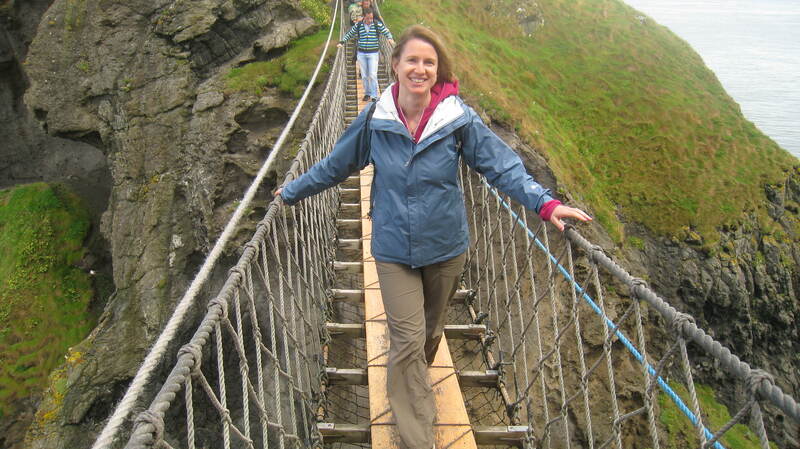 On several occasions I was asked a question about myself, my family, our travels, etc. and was happy to give a full reply only to be interrupted with a story, usually interesting, sometimes funny, and suddenly I became the audience to someone else’s play. Or if I offered what I deemed an interesting anecdote or experience I would be cut off by someone regaling me with his or her experiences in a similar situation, explained in greater detail, with more color. And swear words. 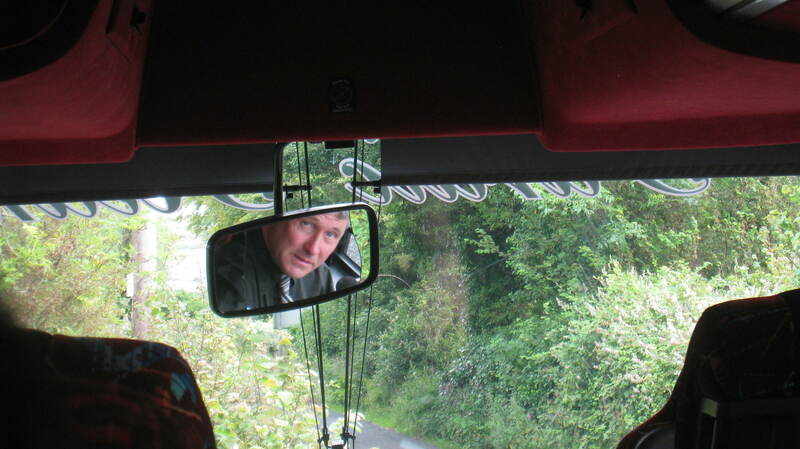 The tour bus drivers we had in Belfast and Galway were no exception. From Belfast we went to the Giants Causeway (see #6 below) on a bus that was in turns exceedingly cold and hot, and decided to break down at least eight times between first and second gears before we arrived at our first stop. The driver (whose name escapes me now but let’s call him George) wasn’t deterred and tried to keep our spirits up by telling us stories, some about various dukes and earls who engaged in centuries of bloodfeud with political rivals, others about himself and the madcap mishaps of his tour bus driving career. Emma on the way back. French guy behind her was on our tour bus. You’ll see him later. 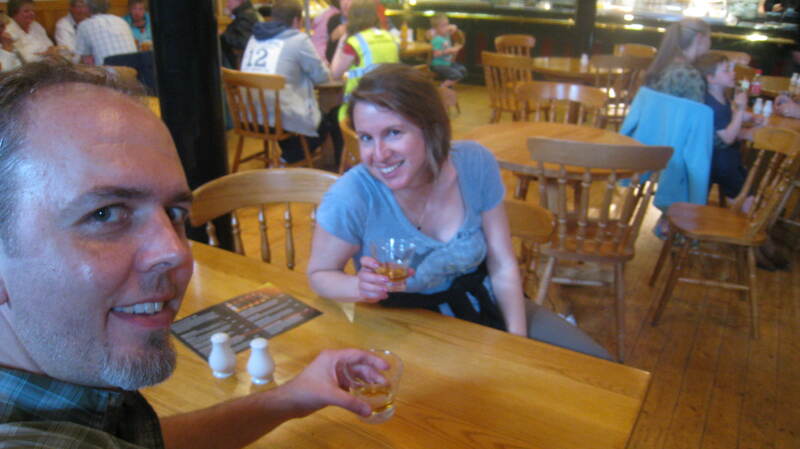 We did make it to Bushmills that day, just in time to have a swift dram of their finest. And managed not to leave anyone behind, despite George’s promise to Steve. 5. Galway is an Irish San Francisco. But with fewer hills. I was told by several people familiar with Ireland to go to Galway. The City of the 14 Tribes. It is “the real Ireland” they said. Still unsure as to what that meant (Leprechauns? Pots of gold? Even more Guinness? 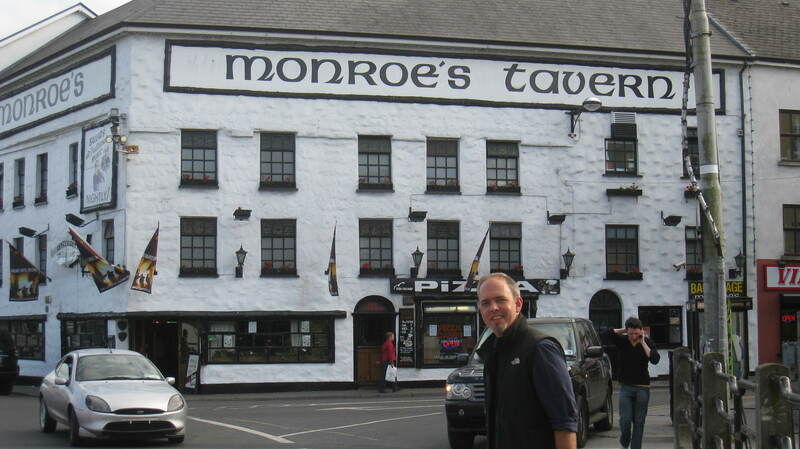 ), Steve and I decided to spend some time on the west coast and used Galway as our base. It reminded me of San Francisco, not so much in looks, although both are cities by the bay, but in its essence, its hippy alternative ethos, its youthful spirit and playful nature. Another interesting connection to California was at our hotel, the Menlo Park Hotel, named after the Menlo Park in California. Two brothers-in-law from Ireland immigrated to the United States and purchased land in northern California south of San Francisco. They called this tract “Menlo Park” after their hometown of Menlo, County Galway. The train station that was built in the area soon after took on the name as did the town that grew around it. The people here seem happier, too, especially compared to those in Belfast. For such a lovely city Belfast’s inhabitants are dour and a bit snippy and this was the only place where we saw multiple bar fights each night. Galway was a mellow antidote to the chaos seething underneath in the capital of Northern Ireland. As in Dublin there was music everywhere with buskers lining the colorful pedestrian way through town. We were urged to go to the market at St. Nicholas Church which was straight out of Haight-Ashbury – tie die and dreadlocks with political consciousness mixed in. For lunch we had falafel with couscous salad from a food cart, followed by beetroot gelato and a fair trade soy latte. The walk along Salthill, which is a long promenade jutting out from Galway proper along which are resort hotels, holiday cottages for let, restaurants, cafes and pubs catering to the tourist and local beach bum, was relaxing and restorative. The weather was relatively balmy during our stay and we saw several people swimming in the grey waters and kids building sand castles along the beach. At a beach amphitheatre we were treated to a free lecture on cause and effect by students from one of the local universities (there are two major universities here as well as several smaller colleges.) Something about why a man had the right to sue the company who made the ladder he fell from. I wish we had stayed here longer, but, as with all of our stops, we told ourselves that we would be back. It sounds like a ride at the State Fair. 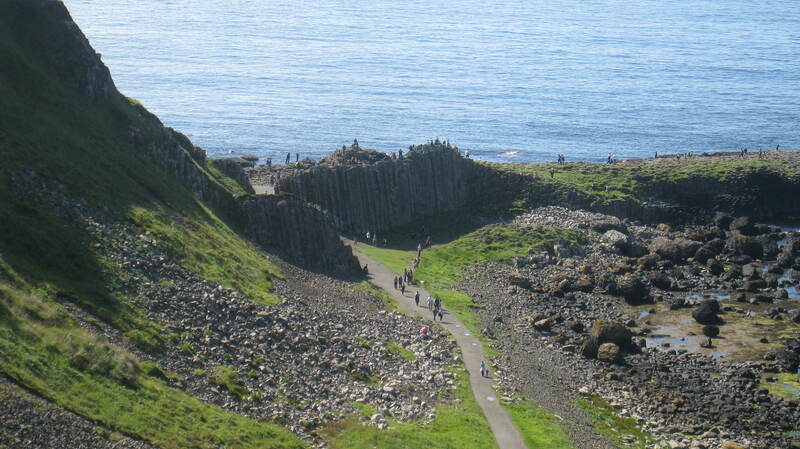 Giant’s Causeway. I had heard of it before but never really knew what it was. The “causeway” made me think of a trail, and “giant” made me think of a big trail, but how interesting could a trail possibly be? At hotel reception the friendly lady who checked us in (one of the rare friendly people in Belfast. They are a glum bunch. But she was from Poland, so there you go.) was adamant that we visit Giants Causeway, pleading “If you haven’t seen Giants Causeway, you haven’t seen Northern Ireland.” Good grief, well in that case sign us up! So it was George’s tour bus (see #3 above) that conveyed us to the Northern Part of Ulster, through villages of white clapboard cottages and cubed farmhouses made of stone, along skinny tree- and brush-lined streets boasting shades of emerald, pea, lime and mint, past castle ruins whose ghosts of their formidable pasts glowered down upon us from high above the hillcrests. What gorgeous country! I noticed many flags flying, not the familiar Union Jack but the Ulster flag: the red cross of St. George overlaid with a raised red hand at its intersection and a golden crown above it. 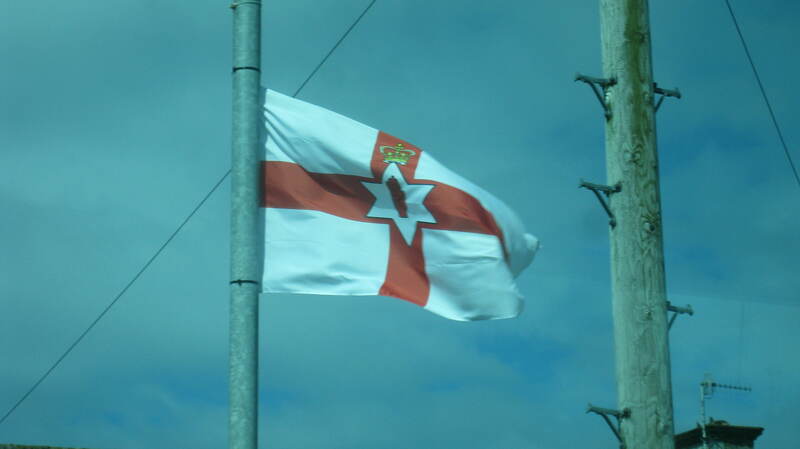 Ulster flag. Red hand, white star, crown. And St. George. The sight of these flags reminded me just how volatile an area this part of the world is, that it wasn’t very long ago that Michael Collins and crew signed the Treaty with the Crown, recognizing the newly-formed Republic of Ireland, comprising all counties minus six which stayed part of the Kingdom under the name Northern Ireland. Most people here are Protestant, fiercely loyal to the UK and have no desire to be part of the Republic. But enough of that. After having visited Carrickfergus Castle, the Carrick-A-Rede rope bridge and Bushmills Distillery on a day providing us with both flood-worthy rains and white-hot sun, we arrived at the Causeway. We had to walk down an undulating path from the parking lot to the Causeway, past a veritable warehouse of rock, formations grotesque and lovely, porous and smooth, abrasive and gentle, lying along a cold blue sea. The entrance to the Causeway was majestic, akin to a cathedral doorway, with its lofty columns and flowery capitals, but the Causeway itself is hard to describe. Imagine a large person, a Giant if you will, pouring cement into long hexagonal-shaped molds, taking the hardened forms and planting each mold randomly on the sand, perhaps breaking off pieces from the top so the height varies, creating a gauntlet of dove grey along the coast. Then this Giant decided to enliven things and create an organ, whose pipes stretch up and along the crumbling cliffs, adorned with shrubby bundles and stalky shoots of green. We learned that the causeway is a collection of columns made of basalt, the result of a volcanic eruption, the molten basalt cooling and contracting through chalk beds during the Paleogene period around 50 million years ago. Today we have the privilege of seeing these great stacks – climbing them, touching them – knowing that millions before us have done the same and wondered at the power of their very existence.